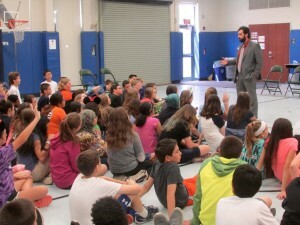 DeMasi Middle School teacher Dave Austin knows students learn best when they hear things directly from the source, which is why he asked Iraqi refugee Moustafa Aldouri to speak with seventh-graders about refugees and immigration on April 22. Aldouri, who emigrated himself in 2008, now works with refugees at Catholic Charities, Diocese of Camden, as a case manager of the Refugee and Immigration Services program. Aldouri spoke to 125 students about his experiences in Iraq, and his family’s journey to immigrate to the United States of America, including years in Syria while they waited for proper forms, as well as what his life was like before the Iraqi war and after his family moved to America. Austin said he volunteered to teach English last summer to refugees at Catholic Charities, which is when he met Aldouri. Aldouri recounted the tale of being kidnapped for nine days after the start of the Iraqi war, and the burglary of his family’s house, which is when they decided to flee to Syria. After leaving behind their home and a 14-hour drive, they crossed the border only to find out they were not allowed to work in Syria, causing even more hardship for the family. Eventually, more than two years later, they immigrated to America and briefly stayed with Aldouri’s mother’s cousins in New Jersey, before settling on their own in Moorestown. Aldouri still lives with his family there. The seventh-graders went on kick off a three-week “stuff-raiser” for Catholic Charities, collecting school supplies and diapers; the homeroom that donates the most will win a special prize. DMS supported Catholic Charities with a similar drive last year, but this is the first time they had a guest speaker from the non-profit. The Evesham Township School District’s Social Studies curriculum includes information on refugees and immigration.